Colombia and FARC rebels have agreed a peace deal. COLOMBIA’S GOVERNMENT AND the FARC guerrilla force last night agreed on a definitive ceasefire, taking one of the last steps towards ending Latin America’s longest civil war. The announcement heralds an end to a half-century conflict that has killed hundreds of thousands of people in the jungles of the major cocaine-producing country. “We have successfully reached an agreement for a definitive bilateral ceasefire and end to hostilities,” the two sides said in a joint statement. The agreement will be signed today. The deal resolves one of the final points in peace talks between the government and the Revolutionary Armed Forces of Colombia (FARC), the country’s biggest rebel group. The deal is to be formally announced Thursday at a ceremony with Colombia’s President Juan Manuel Santos and FARC commander Timoleon Jimenez. The statement said foreign leaders and officials including UN Secretary General Ban Ki-moon would attend. Colombian President Juan Manuel Santos said this week he hopes to seal a full peace deal by 20 July. 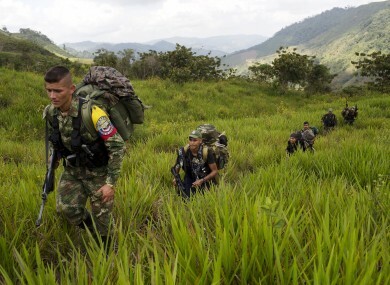 The Colombian conflict started as a rural uprising in the 1960s. It has drawn in various leftist rebel groups, right-wing paramilitaries and drug gangs over the decades. The violence has left 260,000 people dead, 45,000 missing and nearly seven million displaced, according to official figures. Human rights groups say atrocities have been committed on all sides. Many families are still searching for missing loved ones. The accord covers “the laying-down of arms, security guarantees and the fight against the criminal organizations” accused of fueling the conflict, the statement said. “This means the end of the longest and most bloody conflict in the western hemisphere and a new opportunity to bet on democracy,” said Angelika Rettberg, a conflict resolution specialist at the University of the Andes. Email “The longest-running war in the world comes to an end today”. Feedback on “The longest-running war in the world comes to an end today”.